Doctor Who: Big Finish - THE SECRET HISTORY Review | Warped Factor - Words in the Key of Geek. Tony Fyler reads between the lines. The Secret History has a cover. Seriously, if you’ve heard a range of Big Finish stories before you come to this, and the chances are you will have, don’t look at the cover of this one – it gives you a visual detail and a name that will slot together nicely and ruin some good ‘It’s not me, honest’ voice-work on the part of an actor in this story, and give you the main villain not only of this release but of the three ‘locum Doctors’ stories, of which this is the finale. So – order with your eyes closed, download with just one eye watching the progress bar or slip your CD from its cover with your hand over the front. Done that? Good. Now prepare yourself. The final locum Doctor story promises to be a highly exciting meet-up between the callow Fifth Doctor and Steven and Vicki, who are used to the white-haired and rather more commanding old First Doctor. What’s more, it’s a proper old historical adventure in the Marco Polo or Aztecs vein – the Tardis left behind in one part of the ancient world (Ravenna), while the Tardis crew beggar about in Constantinople, consorting with emperors, generals, and classical writers. It’s a good old-fashioned historical romp. Except of course it isn’t – because there are alien shenanigans at work, swapping Doctors about within their own timestreams. That whole plotline is deliciously, exciting played here – it’s probably not too much to reveal that the Doctor has crossed paths with quite a few villains with a penchant for getting involved in local affairs, disguising themselves as a native to the time or place, but this one feels particularly right, and their reasons for doing what they do are spot-on, both in terms of the petard on which they hoist the Fifth Doctor, (who in a significant out-of-character moment, suggests giving modern antibiotics to victims of the Justinian plague), and in their ultimate devious plan, which has wound its way through the three locum Doctors stories, but which, to be fair, you pretty much need this episode to explain to you, and add lots of value to the previous two stories. That ultimate devious plan, by the way? You may well think you’ve seen something fairly similar concocted on screen in the not hugely distant past, by another clever enemy that likes to mess with people. Perhaps it’s just coincidence, but there’s even a kind of Impossible Girl in here, played by the slightly posh acting wonderment that is Lysette Anthony. Wait, did I mention the giant floating stone Medusa heads? OK, well, there’s a pair of giant floating stone Medusa heads in here too. Annnnnd why not? You know damn well if Donald Cotton could have had the budget for giant floating stone Medusa heads in The Romans, they’d have been in it. As it happens, they’re quite important in the ultimate resolution of the plot, so there’s a tip for you – keep your ears on the giant floating stone Medusa heads. Where the fusion between the tone of the First Doctor period and the tone of the absolutely bang-up-to-date, never-mind-Peter-Davison-try-Matt-Smith show becomes a stroke of genius is what happens when the devious alien messer-about of timelines actually wins. What follows is half-pastiche, half differentiation of the difference between the Doctor and the villain – a difference which has never been entirely, one hundred percent evident, but becomes so here with a clarity that ultimately resolves the plot. It’s a great resolution to a seemingly impossible situation, and looked at one way, this story’s scope, and the scope of the locum Doctors mini-series should elevate the central villain to the A-List where they have never truly been before, despite being a firm favourite among discerning fans. There’s every temptation to take The Secret History too seriously, but writer Eddie Robson and director Barnaby Edwards don’t want you to get away with that – certainly the spirit of Donald Cotton’s Who farces, The Myth Makers and The Romans particularly, is alive and well here, but the only thing that allows good farce to still be a believable adventure story is believable characterisation, and Big Finish have skimped on neither. There’s actually not a single badly written, or even slightly written character in this story, Giles Watling as General Belisarius and Tony Millan as his lawyer Procopius being extra special fun as a kind of historical odd couple, suffering each other because their fates fare better together. Tim Wallers as the Emperor Justinian and Sarah Woodward as his languid yet waspish queen Theodora are another fine double act, and Tony Millan does extra-special double duty, giving a wholly different characterisation as Yazid the positively diseased hippodrome team-runner for a few good horse dung jokes at Steven’s expense, but also rather more than that in that we care what happens to him as much as any of the others. Peter Purves and Maureen O’Brien as Steven and Vicki are of course old hands together but here they do something quite important – they highlight the periodicity of First Doctor stories. Whereas in most Big Finish stories, the trick has been to make their characters and situations realistic, deep and believable, here they dial it back the other way slightly to show not just the characters as they would have been, but also to present 1960s Who as a world of its own, for 80s Doctor Davison to stroll around in. 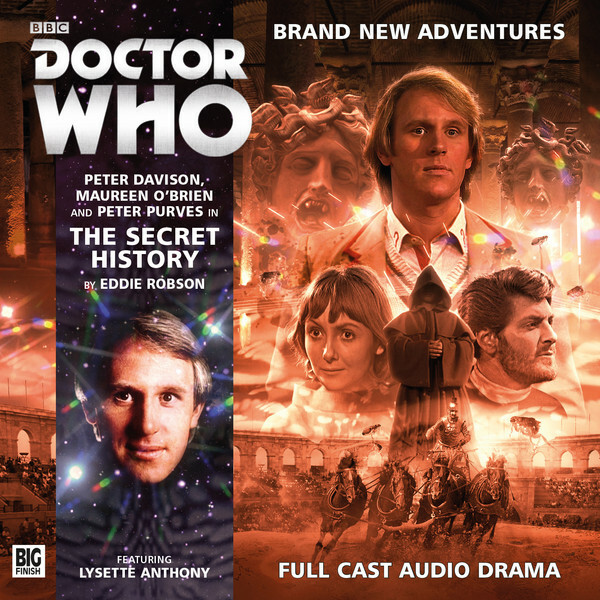 The Secret History is pretty much fun no matter what you’re looking for – traditional First Doctor adventuring in the ancient world, with a chunk of learning melted through; Fifth Doctor style being curious about things and finding alien skulduggery behind the tapestries; ultra-modern timeline-twisting plotlines or gentle historical farce. The story works without feeling like it’s had to be whipped into peculiar shapes – a particular triumph to pull off with a First Doctor-style historical trek – and it’s enjoyable throughout every minute of its running time. The only thing that’s massively, massively wrong with it is the spoilerific cover. Manage to avoid that, and this is pure class from beginning to end.